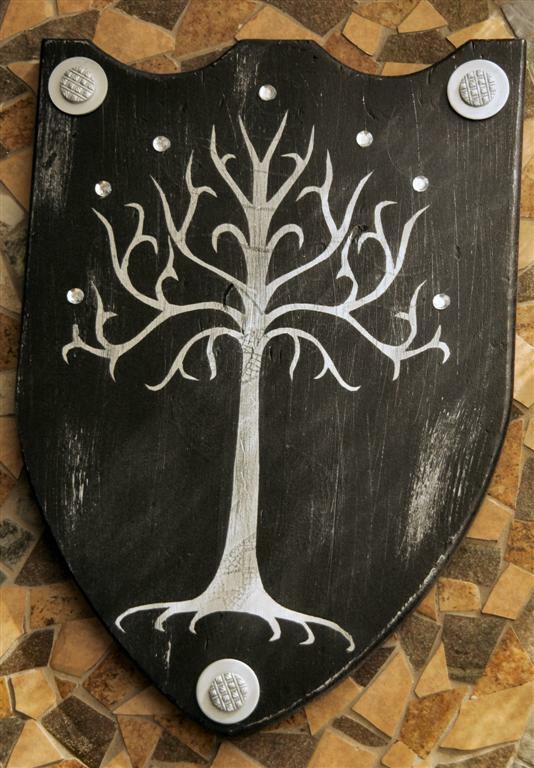 I don't know how many of your remember the shield I made for my husband for Father's Day. 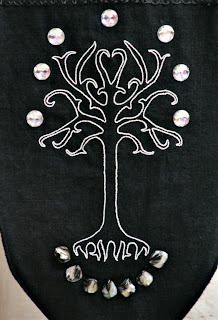 It had the White Tree of Gondor on it from LOTR. When my nephew visited during the summer, he was quite taken with the shield. In addition, to becoming attached to the shield he learned a verse about it from my daughters and they ran around quoting it all the time. 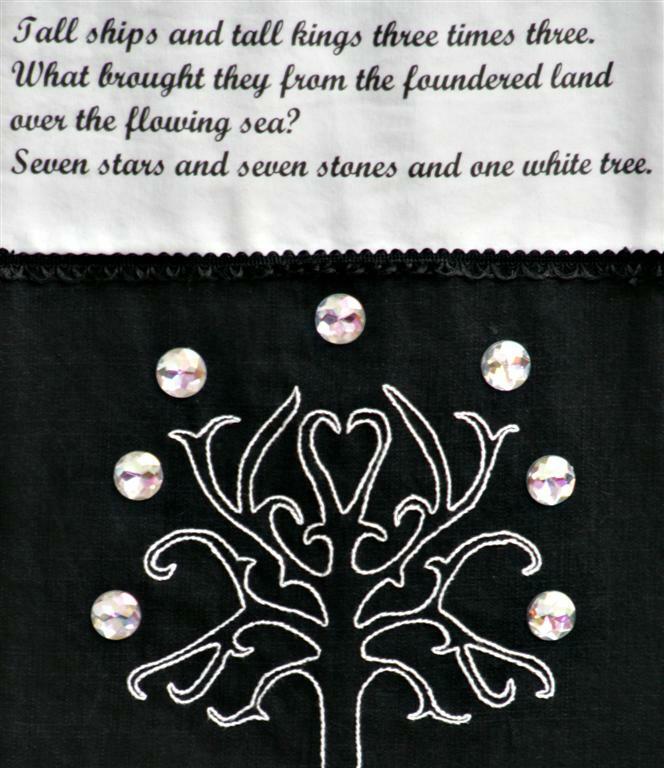 As a result, I decided to make him a banner with the tree and the verse on it. 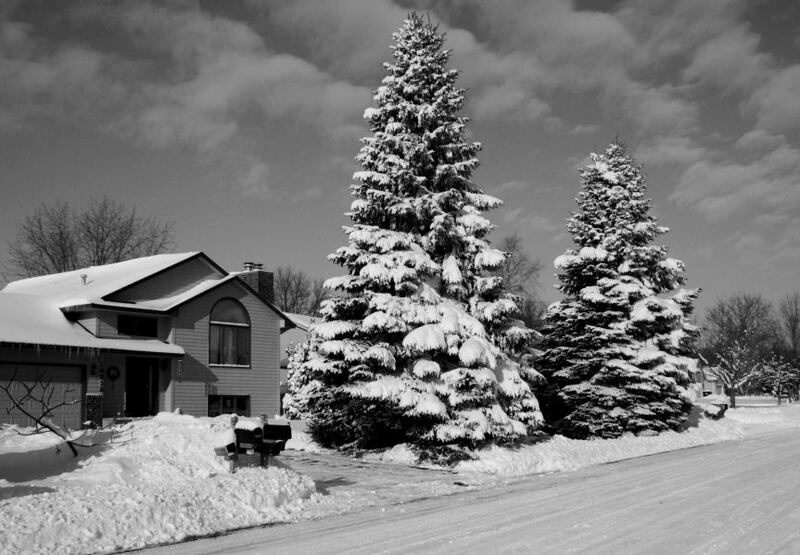 I found an image of the tree on the web. 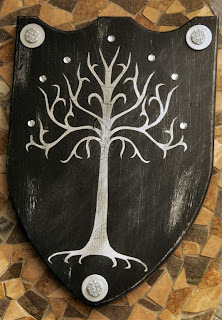 I wish I had found the one I used for the shield, I liked the shape of that tree better. Then again maybe I am glad I didn't find it. It would have taken a lot longer to embroider!! 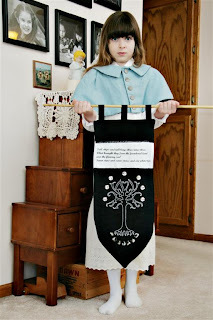 I used dress maker's paper to transfer the image to the black fabric and then I embroidered it with white embroidery floss. 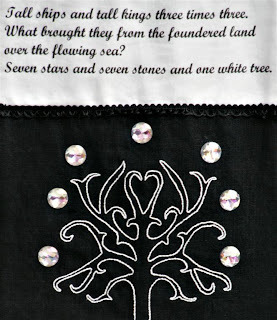 I found stone 'beads' that I sewed down for the seven stones and fake gems that I glued down as the stars. I printed the verse on white fabric using my printer and some freezer paper. Tall ships and tall kings three times three. I had to buy the stones and the gems. Absolutely beautiful. I like both trees but I especially love how the banner turned out. Lovely work. That is just glorious! He will be so excited to receive it! What a treasure he'll receive! It's absolutely wonderful. We are LOTR people here and this is so pretty and well done Melissa. As always I am impressed with the cool and intelligent kids in your family. They run around quoting LOTR! Beautiful piece, Melissa! WOW you are so clever. 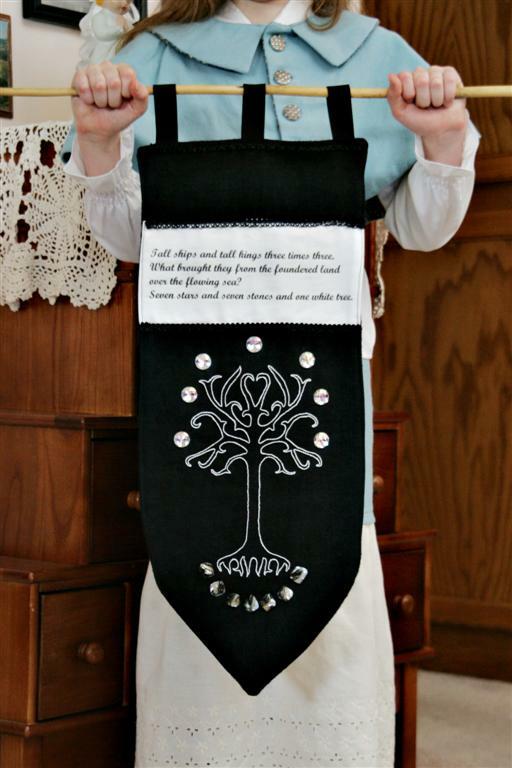 Your husband is going to LOVE that, it is very thoughtful and special! LOTR Trilogy are my favorite movies ever!!! Especially the second one! These are awesome projects and extremely brilliant! Boy, you have been busy! 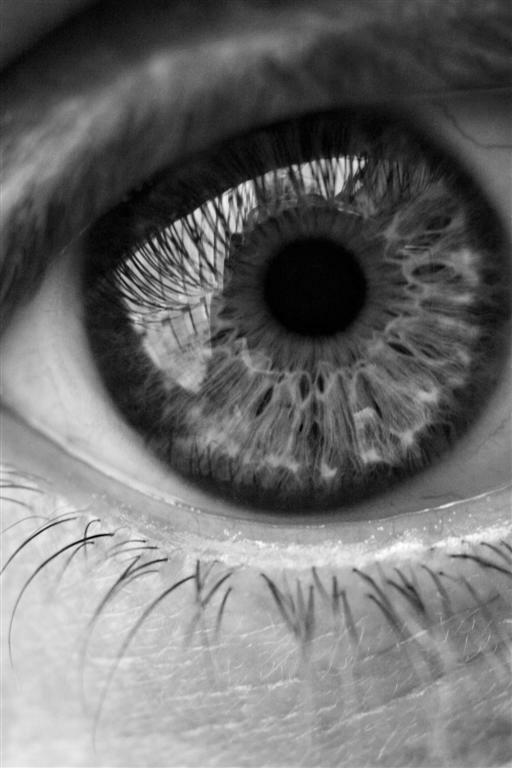 I think it looks perfect. What a lovely Aunty you are! What a special gift for your nephew! A creative idea -- and you used up some of your stash! WOW, you did a great job on that Ÿ Thanks for visiting me over at Pittypat Paperie. Hope you can drop by again sometimes. Stoking the imagination, eh? Nice work. Glad you're back, Melissa! I've missed you. 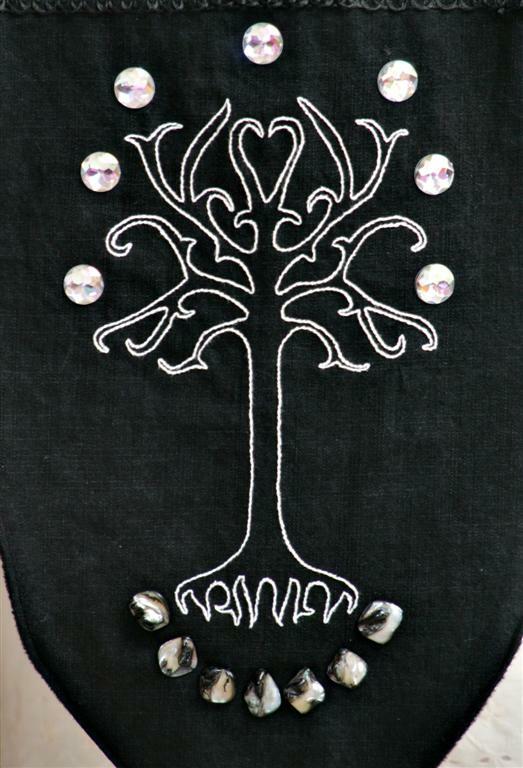 ;) Your Tree of Gondor is wonderful. I know your nephew will be excited with your gift. 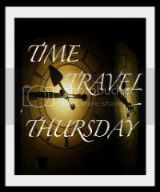 Thanks for linking your creative talent to my party each week. The banner is fantastic! Awesome embroidery! and I do remember the shield which is also awesome. OH that looks fantastic! Great job! I'm so glad you linked this up. I love it so!